Preparation time: 10 minutes. Cooking time: 20–25 minutes. Dice zucchini into 1/2-inch pieces. Thinly slice chilies. Coat a large nonstick skillet with cooking spray, add oil, and warm over medium-high heat. Add onion and cook, stirring frequently, until translucent, about 3–4 minutes. Add bacon bits and corn and cook 2–3 minutes more, stirring frequently. Add water, squash, chilies, and salt; stir to mix. 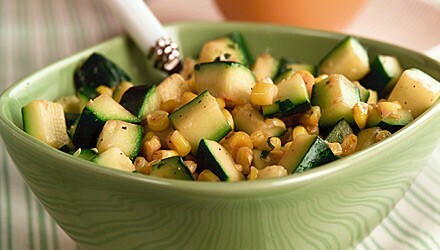 Cover pan, reduce heat to medium, and simmer 10–15 minutes, or until corn and zucchini are tender; stir occasionally. Exchanges per serving: 1/2 starch, 1 non-starchy vegetable. Carbohydrate choices: 1. Tami Ross, a Diabetes Nutrition Specialist and Certified Diabetes Educator in Lexington, Kentucky, is a big fan of Southwestern cuisine.